The XC60 was 19 percent less likely than other Volvos to be involved in property damage accidents, the study says. DETROIT -- A study of the Volvo XC60's low accident rate offers evidence that collision avoidance systems can improve vehicle safety. The XC60, which has a low-speed collision avoidance system dubbed City Safety, was involved in 27 percent fewer property damage accidents than other mid-sized luxury SUVs, according to a report released today by the U.S. Highway Loss Data Institute. 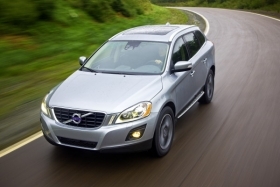 The XC60 also was involved in 51 percent fewer bodily injury accidents. Plus, the XC60 was 19 percent less likely than other Volvos to be involved in property damage accidents, the report says. Institute President Adrian Lund said that statistic is noteworthy because, in effect, it eliminates any notion that Volvo drivers are simply safer drivers than a general sampling of drivers. City Safety uses an infrared laser sensor to spot possible accidents at speeds ranging from 2 to 19 mph. If the motorist fails to react in time, the system automatically activates the brakes. The unit is not designed for speeds above 19 mph. The survey suggests that collision avoidance systems can effectively help distracted motorists who fail to notice an impending accident, Lund said. "Driver mistakes are responsible for 90 percent of crashes," Lund said in an interview. "This is the first technology that can reach out to the driver at the moment of danger and bring his mind back to the danger." Later this year, the Institute will study the effectiveness of collision avoidance systems designed for high speeds, Lund said. The Institute said there has been no other comparable data made public about the technology. "This is the first real-world data on so-called advanced collision avoidance systems," said Russ Rader, spokesman for the Insurance Institute of Highway Safety, the parent organization of the Highway Loss Data Institute.